Today, 11711 yen on Amazon Japan. riringo (4 anno/i fa) #2255260I'm honestly disappointed in this. His face doesn't look like it belongs to a kid at all (where's the baby fat? Bigger features? 10 year olds don't have facial proportions like these). I expected Kotobukiya, of all figure companies in the Western market, to know how to make soft features and to make him NOT look like another tiny adult, but I guess not. luvintulips (4 anno/i fa) #2254169His stupid face is so Damian like it's perfect! You will be mine you big batbaby. I'm honestly disappointed in this. His face doesn't look like it belongs to a kid at all (where's the baby fat? Bigger features? 10 year olds don't have facial proportions like these). 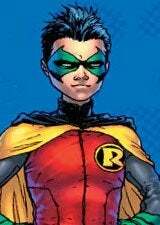 His stupid face is so Damian like it's perfect! You will be mine you big batbaby. My kohai is going to have a heart attack. She's been waiting years for a Damian.